Ricky Burns said weight just “dropped off” him as he prepared to fight Anthony Crolla this weekend in what will be the Scot’s first bout in the lightweight division since since November 2015. 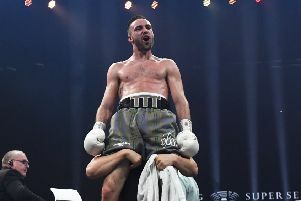 “I knew getting down to lightweight could have been hard but I’ve been on the diet with no cheating and the weight’s just seemed to drop off,” said the 34-year-old, who has held world titles in three weight divisions. The former WBO lightweight champ added: “I’ve done it comfortably this time – I have more or less been hovering around the weight limit for the last 10 days, and I’m still feeling good, talking to people, smiling. “Tony [Sims, Burns’ trainer] knows when I put my mind to it I can do it, and I think he’s happy with the way I have done it this time. Crolla will be wearing the Manchester bee with pride on what promises to be an emotional night. The bout at Manchester Arena sees local boy Crolla return to action at the venue less than five months on from the terror attack there which killed 22 people. The 30-year-old, who has had eight of his last nine fights at the arena, will have the city’s worker bee displayed on his shorts. It will also feature on his socks – the product of a collaboration between him and fightwear supplier Suzi Wong – pairs of which are being sold, with profits going towards supporting those affected by the 22 May tragedy. The bee emblem has been widely adopted as a symbol for the city’s togetherness following the attack. The contest has a last-chance saloon feel for the fighters in terms of potentially going on to compete for world titles again. Crolla (31-6-3, 13 knockouts) has lost his last two fights, Jorge Linares claiming the WBA lightweight world title from him in September 2016 and winning a rematch in March. The following month saw Burns (41-6-1, 14 KOs) lose the WBA light-welterweight crown to Julius Indongo.